Summary: Clinging to an unfinished letter written by her recently deceased father, young Momo moves with her mother from bustling Tokyo to the remote Japanese island of Shio. Upon their arrival, she begins to explore her new habitat, meeting local children and learning their routines and customs. However, it’s not long before several bizarre occurrences crop up around the previously tranquil island. Orchards are found ransacked, prized trinkets start disappearing and, worst of all, each morning after her mother leaves for work, Momo hears strange mumblings coming from the attic of their home. Annoyed by these creepy goings-on and her mother’s refusal to believe them, Momo embarks on a strange and supernatural adventure to discover the source of the mischief, which leads her to a trio of troublesome imps: the flatulent lizard Kawa, the childlike Mame and their hulking ogre leader Iwa. Momo also learns that her visit to the island is in some way connected to her father’s mysterious letter. 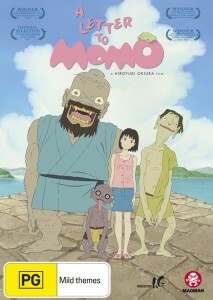 A Letter To Momo is a Japanese animated feature, produced by Production I.G. and directed by Hiroyuki Okiura. It is released on DVD and BluRay in Australia by Madman Entertainment. A Letter To Momo is a beautiful story and very true-to-life in it’s character portrayal and relationship aspects. This then melds with the fantastic and supernatural as Momo meets her ‘guardian angels’ who have taken unique forms from an old comic she was reading. Shocking and hilarious moments ensue as she tries to deal with an unreal situation on top her own emotional ordeals after the death of her father and sudden move to a new home. As we settle into life at the same time as Momo we experience childhood again and feel her bashfulness as her mother tries to force a friendship with local children (only to embarrass Momo) and relive all of the typical moments of childhood. The real stirring begins when we learn what has brought Momo and her mother to this new life and how deeply the impacts of recent tragedy still play on this child’s heart and mind. The natural and ‘everyday’ way that the storytelling works is something the director and writers should be commended for. The characters are brilliant – the humans are believable and ‘true’, while the otherworldly are fantastic and engaging and lovable despite their mischief. One cannot help but care for Momo and want the best for her in each situation. A few moments I wanted to cry for the emotional jolts and later again for the pure joy and enjoyment I took from this movie. As usual, I watched the production in the original Japanese which I think is an absolute must for this movie. The portrayals are true for each character and not ‘hightened’ like mass media anime. This is a real character piece with honest emotion and performances which I think would be harmed by dubbing over language and mannerisms of an entirely different culture. The honesty in which it is played makes for a unique and touching experience. The production overall was, in a word: beautiful. The unique style, much different than the usual anime ‘manga style’ adds to the believability and draws the viewer more deeply into the story. The production staff have made every effort to bring the audience into the story. Beautifully painted backdrops, realistic characters and a realistic sense of movement in the animation show just how great the thought and effort has been in the making of this film. The simpler character style and painting creates a more realistic look than expected, with the more predictable and fantastic stuff left for the supernatural figures. Great direction and storytelling has paid-off for a highly rewarding and encapsulating viewing experience. This is a great DVD from Madman, which includes Featurettes on the making of the production (which is really great to watch to see how this splendorous movie came to life from concept to completion). Also included are an art gallery, test clips and trailers. All of these make for a value-packed DVD and an intensely enjoyable and uplifting experience which has quickly become one of my favourite movies. Other Subculture Entertainment Black Butler: Book Of Murder reviews: Nil. 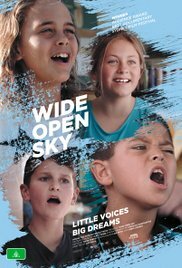 Summary: Wide Open Sky follows the heart-warming story of an outback Australian children’s choir. Chronicling their journey from auditions to end-of-year concert, the trials of trying to run a children’s choir in a remote and disadvantaged region are revealed. Here, sport is king and music education is non-existent. Despite this, choir mistress Michelle has high expectations. She wants to teach the children contemporary, original, demanding music. It becomes clear for the children to believe in themselves, they all need someone who believes in them. You can hear Greg King’s Wide Open Sky review on The Good The Bad The Ugly Film Show Ep # 172. Other Subculture Entertainment Wide Open Sky reviews: You can hear our Wide Open Sky review on The Good The Bad The Ugly Film Show Ep # 172. Summary: Sun Wukong, (The Monkey King) is a monkey born from a heavenly stone who acquires supernatural powers. After rebelling against heaven and being imprisoned under a mountain for 500 years, he later accompanies the monk Xuanzang on a journey to India. Thus, according to legend, Buddhism is brought to ancient China. This much beloved story, is as much a part of Asian culture as The Iliad and The Odyssey or The Wizard of Oz are to the West. 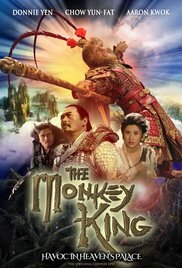 The Monkey King is a Hong Kong Chinese film based on classic stories most famously collected and retold in the novel “Journey To The West”, published anonymously but most commonly attributed to Wu Cheng’en. The screenplay of this film was written by Szeto Kam-Yuen, Edmond Wong, Lola Huo and Dali Chen. The story revolves around Sun Wukong, the Monkey King, as he is raised to the Heavens to be taught higher skills and learning, including magic, and his subsequent fall and rise (and fall again). It is but an opening portion to the whole story of “Journey To The West”, but sets up and establishes the main character nicely. The world created in the film is full of beautiful imagery and quite faithful to the legends and beliefs of the centuries these stories were told, even if being an embellished version of the origin part of Sun Wukong’s story. The CG elements were used quite successfully to realise the world and supply some great imagery. It is, however, let down a few times where modern audiences of Hollywood blockbusters might jeer, but it is not so bad as to ruin the overall aesthetic and charm of the movie. The locations created as well as the dragons we see throughout the film tend to be examples of the best computer effects work. I think the points where it falls a little flat are mostly to do with scene structure and how the elements are put together. There is sometimes a ‘cartoony’ feel to the movie, but this does not jar with the overall tone, which is that of a grand adventure. Part of this is attributed to some of the slightly underdeveloped CG in scenes – such as the one where Sun links his tail affectionately with the vixen girl, Ruxue (Xia Zitong) – or when further animal spirit characters are introduced and they are all performers in costume rather than CG elements. The costume creations are marvellous in this movie, and for the animal spirits this works very well as you have real actors giving them character through movement and behaviour and making them interesting despite having no real development or stake in the plot. Donnie Yen’s portrayal of Sun Wukong was exceptional, creating a whole character with well thought-out movement style for a monkey, carried right through to the development of a specific fighting style. The more subtle qualities he uses to portray the mischievous, yet good-hearted, protagonist through all of his furry make-up and costuming deserves much praise. As something of a change to the tradition, Sun is given a love interest as a means to get him invested in the battle to come, and also as a means for the villainous Buffalo Demon King (Aaron Kwok) to manipulate the character into rash and wilful action. It is the monkey’s impetuousness and naiveté that get him into trouble, as fundamentally he is a child character. This is essentially a morality tale with examples of our basic behaviours and what we need to learn to be better and enlighten ourselves; just as many old tales of myth, legend and religion have told us for centuries. This is an exciting action tale which subtly educates us on the way; a great and colourful adventure for children to watch but equally rewarding for an adult who can more clearly notice the depth. For kids of the Seventies and Eighties, you may remember the Japanese TV series adaption of “Journey To The West”, titled “Monkey” (no, it’s not named ‘Monkey Magic’ – that’s just a line in the theme song lyrics!). Whether or not it is deliberate, it seems like the director may have given some nods to this famous and beloved series. Most notably was the execution of one of Sun’s tricks – the conjuring of an army (of clones of himself) created by the shedding of strands of his hair. The way it is shown took me right back to watching it in the old show, only with a bit more skill to the effects work. On the whole, while some of these effects and the structure of the elements could have used some work, the movie itself is very well done and engaging. The end is set-up to carry on into the next chapter of the story where Sun Wukong begins the journey to the West with the boy monk, Tang Sanzang. This story begins in the sequel, released in February 2016. Summary: Continuing his “legendary adventures of awesomeness”, Po must face two hugely epic, but different threats: one supernatural and the other a little closer to his home. Five years since he last skiddooed onto the scene, Po the Panda is back and this time, for fear of sounding like a movie poster, he’s bringing the whole family. Yes, a chance encounter at his adoptive father’s restaurant leads Po (Jack Black) to meeting up with his long lost Dad, Li Shan (Bryan Cranston). Meanwhile, the vengeful spirit of a great warrior known as Kai (JK Simmons) has returned to the mortal realm and is seeking to steal Po’s chi. This is the second sequel to DreamWorks’s 2008 hit and it’s amazing to see the difference between this and their previous flagship series, Shrek. By the time Shrek coughed and spluttered into his third sequel, the franchise was nothing more than weak storylines on which to pin dated pop culture references and Eel songs. Conversely, Kung Fu Panda 3 allows Po and his pals to grow organically. Despite being declared Dragon Warrior in the previous film, there’s still much for the young panda to learn. Including it seems, that of how to be a panda. With his newly found father, Po ventures to their secret village in the hills to understand panda nature (tips include that they don’t do stairs and they don’t get up before midday) and potentially learn something that can defeat Kai. Yes, this ‘just be yourself’ through line is a tried and tested formula, but it’s yet to feel derivate in the Panda universe. Po, despite his prowess, is a still a student. He has questions about his place in the universe that he hopes to answer. Meanwhile, there is only so many ways to you teach an ogre that’s okay to be an ogre, as long as you change yourself a bit. 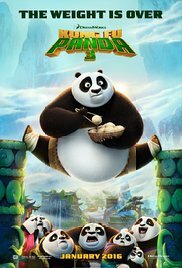 Kung Fu Panda 3, as has become expected, is beautiful with traditional animation – admittedly done by computers – used for line drawn flashbacks. It’s a simple trick, but one that is used to great and emotional effect. Elsewhere the vocal talent is uniformly brilliant, with JK Simmons sounding like he’s channelling the angriest of angry John Goodmans, whilst James Hong steals every scene as Po’s adoptive father, Mr Ping; who doesn’t take kindly to others cutting his grass. Rumours are that DreamWorks’s have at least another three chapters in the story of Po, and whilst that is a tempting offer, should they never surface, rest assured Kung Fu Panda 3 is a wonderful and joyous ending to a truly enjoyable series of films. Summary: Alvin (voiced by Justin Long), Simon (Matthew Gray Gubler) and Theodore (Jesse McCartney) return and this time they have a huge problem. Not only has their ‘father’ Dave (Jason Lee) put a stop to them performing live, so they can be normal kids for awhile, but his relationship with Samantha (Kimberly Williams-Paisley) is going so well it looks like they are about to get engaged. Now the Chipmunks are happy for Dave but are concerned that if he marries Samantha that wil mean that they that are now ‘brothers’ with a boy that seems to enjoy torturing them, Miles (Josh Green). When they learn that he isn’t too happy about being related to them either the four decide to embark on a road trip to Miami to prevent the engagement from happening. Well I guess it had to happen to one film and for most territories around the world it was Alvin And The Chipmunks: Road Chip that went up against the might of Star Wars: The Force Awakens. When you actually think about it it’s not such a bad strategic move considering that most little kids who will want to see Alvin and co will have very little interest in going to see a film about intergalactic warfare. That leaves the big questions being… is this the kind of movie that will entertain or put my children to sleep? Anyone who has sat through all four Alvin & The Chipmunks movies will tell you that this has been a franchise that has been all over the shop when it comes to quality. The first film surprisingly had meaning taking a huge swipe at the music industry and the way it treats young artists, but from then (like most of the franchises) these days it seems to have had more lows than highs. That is where you might be pleasantly surprised by Alvin And The Chipmunks: Road Chip. While the cast in front of the camera (and behind the microphone in some cases) haven’t changed this time around, the crew behind the scenes has. Known comedy director Walk Becker (who has previously brought us Van Wilder and Wild Hogs) steps up to the plate and is probably the reason behind a lot of the slapstick that surfaces this time around. Also new to the creative table are screenwriters who can boast films like Mrs Doubtfire and Due Date on their Resumes. The new creative team behind the film takes this movie in a completely different direction to the last two films. Here the franchise once again finds its heart as the film explores the delicate subject of siblings being brought together as parents remarry etc. Surprisingly the film actually does that quite well, and while Miles is originally set-up as a brat you are supposed to hate the screenwriters do actually take his character on a journey that allows the audience to see how he ended up the way he did. It’s surprisingly moving. Of course as you would expect from a movie aimed at the younger demographic there is also a lot of scenes that adults are going to find ‘silly.’ The battle scenes with Agent Suggs (Tony Hale) are over the top and too slapsticky for adults to really enjoy but you can guarantee younger kids will be in hysterics over them. Likewise the Red Foo scenes which are nauseating for anybody that has taste in music, but luckily the latter music scenes depicting the Chipmunks doing everything from playing in a redneck bar to rocking out with a brass band in New Orleans are a lot better. 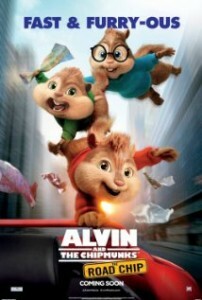 As is normally the case with this franchise the actors are really overshadowed by the CGI chipmunks. Jason Lee seems to be cruise control, as is Kimberly Williams-Paisley. Tony Hale overacts constantly throughout the film, something that it is obvious he was asked to do by the creative team and for the most past it works. The biggest surprise though is the acting performance of Josh Green. The young inexperienced actor really shows that he may be an actor to watch in the future and he masterfully takes his character on a journey throughout this film. He manages to switch from comedy to moving emotionally scenes at a whim and he is one of the few actors who isn’t over-shadowed by his furry, cute co-stars. Alvin And The Chipmunks: Road Chip has enough crazy scenes and music sequences to keep younger kids happy while the older generations will warm to the more heartfelt moments throughout the film. Yes this film isn’t the car crash many expected it would be. Other Subculture Entertainment Alvin And The Chipmunks: Road Chip reviews: You can listen to our full Alvin And The Chipmunks: Road Chip on The Good The Bad The Ugly Film Show Ep #158. You can also read our full Alvin And The Chipmunks: Road Chip review on The Book The Film The T-Shirt. Summary: 12-year-old Peter (Levi Miller) has always thought he was special despite what the nuns at the orphanage tell him. But he doesn’t realise how special he is until he is whisked away in the night and spirited away to Neverland where he is forced to work for Blackbeard (Hugh Jackman) who dreams of ruling the mysterious land. 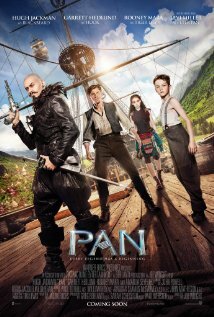 After a daring escape alongside Hook (Garret Headlund) and Sam Smiegel (Adeel Akhtar), and a chance meeting with Tigerlily (Rooney Mara), Peter learns that he is indeed special and soon sees why Blackbeard wants him dead. Pan was always going to be a film that came under a lot of scrutiny and was going to cop a fair whack of criticism. There are some Disney purists out there that believe once Disney has touched a story there is no need for anyone else to explore the story, and while I disagree with that I do agree with the fact that their have been some pretty dreadful movies over the years that have touched on both the Peter Pan and Captain Hook storylines. What I didn’t expect for Pan though was for it to become a film so alternative that some parents are arguing whether or not it is suitable for children to watch or not. Now I’ll be honest helicopter parents who are too afraid to let their children play in dirt annoy me. They are normally the same kind of parents that will look for the slightest detail in a film that makes it ‘unwatchable’ for kids and then take to social media on a rant, or tell you why you liking the film is wrong! I’ll also admit that I grew up in the generation where films like Never Ending Story and all it’s magic, plus a healthy dose of monsters with chainsaws (I’m looking at you Gremlins) was considered okay for children to watch at the cinema. Having said that I do agree that Pan is not for very small children, but hey if you have older kids and teens then go nuts because the alternative feel to Pan is actually something a little bit refreshing. Yes there are some problem scenes for small children, Blackbeard has no problem firing guns at children and natives alike while at the same time Tigerlily doesn’t mind getting a little stabby with some sharp objects but there is also a hell of a lot to like about this film as well. For starts director Joe Wright (known for Pride & Prejudice and Hanna to name a few) and screenwriter Jason Fuchs’ choice to include the songs of bands like Nirvana and The Ramones during some of their scenes came as a complete surprise while the aggression of characters like Blackbird seemed to make this feel seem a lot more ‘real’ then what your typical style of ‘slapstick violence’ would have. Having declared that there were things about Pan that I loved I also have to admit that the film had its weak points. While the film moves along well it seems to lose a lot of its suspense once Peter, Sam and Hook are out in the wilds of Neverland and despite a relatively good flying Pirate ship chase and battle not even this scene seems to have captured the air of suspense that it deserves. It almost felt at times that Wright is the kind of director that can milk suspense out of a dramatic scene, like when Blackbeard first confronts Peter in the captain’s cabin, but is a little bit out of his depth when it comes to huge action sequences. The same can also be said for the screenplay’s set up of characters. Peter and Blackbeard get wonderful set-ups which in turn allows Hugh Jackman to shine, but then there is the character of Hook, who any Peter Pan fan will tell you becomes a major character in the lead character’s life. Here Hook is a bit of a mystery, and strangely seems to be a nod as a tribute to Indiana Jones. This also causes an inconsistency in the acting as well. Levi Miller announces himself as a little star with a brilliant performance in his debut lead role but even he is out acted by Hugh Jackman who relishes in the role of the ‘bad guy’ Blackbird. Jackman here puts in a performance here that we have wanted to see Johnny Depp deliver over the past few years. Jackman is completely transformed and unrecognisable and he genuinely becomes one of Hollywood’s meaner screen nasties. Sadly, the film’s poor reception means most cinema lovers will miss out on the performance. Also stepping up here is Rooney Mara. Sure she doesn’t have anything near as dramatic to work with as she did when she did Girl With A Dragon Tattoo but she does has her moments as Tigerlily. The criticism she has copped for being a white actress playing a ‘native’ role is also ludicrous. If you look around the ‘tribe’ in Pan they seem to be made up of people of all skin colors, including an Australian Aboriginal playing the tribe’s leader, so seriously the complaints are just a few keyboard warriors with very little to do. Be warned if you’re a fan of Amanda Seyfried or Cara Delevingne just beware that their roles are very small indeed. Pan certainly does not deserve the backlash that it has received as a film. Sure some of the action sequences do not reach the great heights that they should, but for the most part this is a well acted and alternatively fresh film aimed for teens. Other Subculture Entertainment Pan reviews: You can listen to our full Pan review on The Good The Bad The Ugly Film Show Ep #147. You can also read our Pan review on The Book The Film The T-Shirt. 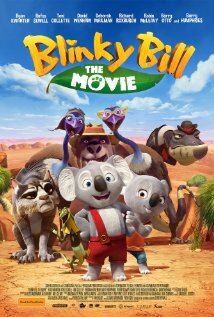 Summary: Blinky Bill (voiced by Ryan Kwanten) the mischievous koala is devastated when his father, Bill Koala (Richard Roxburgh) leaves their home town and goes exploring in the outback but hasn’t returned after twelve months. Despite promising his mother (Deborah Mailman) that he won’t Blinky heads off to look for him. Soon Blinky is joined by an accidentally freed zoo koala named Nutsy (Robin McLeavy) and a crazy filled neck lizard called Jacko (David Wenham) as he battles the dangerous outside world in a bid to find his Dad. The journey is made even more dangerous by the fact that they are being pursued by a cranky cat (Rufus Sewell) who wants to make the koalas his dinner. Blinky Bill is one of those children’s characters that never seems to go out of fashion. Created by author Dorothy Wall in 1933 generations of Australian children have grown up loving Blinky in the countless television shows, books and two movies that have told the larrikin koala’s stories over the years. Now in 2015 Blinky gets a resurgence and unlike so many other characters that have been re-invented for the kids over the years this is one character’s story that still holds up. Aside from trying to make a character cool for the younger generation that has been around for over 80 years there are a few other hurdles that director Deane Taylor has had to overcome with Blinky Bill The Movie. First of all is trying to get kids who have grown up on the slick animation of Pixar to warm to a movie that uses some old fashioned style animation. The key it seems in this case was to come up with a story that transcends generations and here the filmmakers seem to have done that well. Not surprisingly when you consider that Taylor has worked on some legendary animation projects over the years including Popeye, Casper, The Flintstones, Pink Panther, Footrot Flats and Tim Burton’s The Nightmare Before Christmas the film does conjur up that simple old time animation story of a character on an adventure while being pursued by a character wanting to put an end to it – yes Sewell’s cat here is like the Will-E Coyote or Elmer Fudd characters of old. Taylor brings a simplistic style to the film’s storytelling and it ends up working. To be honest there is nothing new here but for some reason the audience finds themselves barracking for the little koala and his friends and while some of the gags are a little childish there are some other humorous moments in there that are obviously designed to bring a smile to older audience members. Like the Ginger Meggs stories there are some things about Blinky that are a little questionable about whether today’s parents are okay with their children watching it but for the most part this is a fairly innocent film. Some serious issues around refugees and conservation does get a look in with the screenplay but just like Oddball this isn’t a film that you are going to walk out of and feel like you have been preached at with. One of the obvious things about Blinky Bill The Movie is that this is a film that seems to be aimed at an international audience rather than just an Australian audience. The inclusion of big name actors like Toni Collette, Barry Humphries, Ryan Kwanten and Richard Roxburgh do give this film a lot of credibility while the inclusion of so many lovable forms of Australian wildlife could just give this film a life outside of Australia if it is marketed right. Blinky Bill The Movie does nothing wrong. A simple story that has you barracking for the young koala as he outruns the villainous cat is very Looney Tunes like, while the script is smart enough to also include some touching moments about the relationship between a father and a son. Blinkey Bill The Movie is mainly for younger children but certainly won’t put an adult to sleep, it’s just innocent fun. Other Subculture Entertainment Blinky Bill The Movie reviews: Blinky Bill The Movie with be reviewed in an upcoming episode of The Good The Bad The Ugly Film Show. Summary: Middle Island was once a flourishing penguin population but sadly over the years the numbers have dropped from a few thousand down to around ten due to the fact that foxes have worked out how to get to the Island. This has now caused problems for Emily Marsh (Sarah Snook), Jack Jones (Richard Davies) and Zoe (Tegan Higginbotham) who have been told they will lose their jobs if the Island is no longer considered a sanctuary. As the nearby town of Warrnambool works hard at becoming a tourist destination by having the local council including Mayor Lake (Deborah Mailman) working with an advisor named Bradley Slater (Alan Tudyk) to come up with new tourism ideas. But when Bradley’s idea means the future of Middle Island is doomed a local chicken farmer named Swampy Marsh (Shane Jacobson) and his granddaughter, Olivia (Coco Jack Gillies) decides it is up to them and a mischievous dog called Oddball to come up with a way to fix everything. This has been the year when the Australian film industry has hit back with vengenance. Amongst the good drama films that have surfaced Aussie cult cinema has led the way around the world with films like Kill Me Three Times and Wrymwood making the charts in America while Mad Max: Fury Road seemed to thrill action film lovers as well. Of course one of the biggest Australian films over the past few years has been Red Dog – a family film that surprised everybody. Not surprisingly many Aussie filmmakers thought they had just discovered the best way to make people watch your film and that was to create a family friendly film about dog. Several projects fitting that description have fallen by the wayside but now Oddball manages to make its way to the big screen. Yes I’ve made the clichéd comparison between Oddball and Red Dog so now let’s take a look at whether or not the film is actually any good. The answer to that question is a solid yes because director Stuart McDonald (who over recent years has worked on all of Chris Lilley’s projects) and screenwriter Peter Ivan have been brave enough to make Oddball a little bit different to the thousands of dog movies over the years. When the opening to Oddball boasts that this is a fairy tale they aren’t joking. Yes this is a true story that saw the people of Warrnambool embrace a Maremma dog but together these talented filmmakers have told the story in a fairy tale style which incorporates a smart script with a little bit of pantomime acting, especially from comedian Frank Woodley who plays the mean dog catcher. In the past this style of filmmaking has led to some pretty woeful Australian films, I’m looking at you Welcome To Woop Woop, but here it makes a refreshing difference and makes Oddball the kind of film that could be enjoyed by the whole family. Ironically when watching Oddball the old fart joke and over the top dog chase does have a bit of a feel of a Paul Jennings story and sure enough a quick check of Peter Ivan’s bio shows that he was one of the writer’s on Two Twisted, a show based on Jenning’s work. Somehow this script manages to incorporate that kind of humor with a dramatic storyline revolving around how greed can impeach on nature and also explores the fractured relationship between father and daughter when it comes to things between Swampy and Emily. Yes Ivan and McDonald together have somehow created a film that will actually have you laughing one moment and tearing up the next. The key to this film working as well as it does though is through it’s casting. Shane Jacobson does a great job in the lead role of Swampy. He made the character of Kenny famous all those years ago and while his comedic talent is held back a little here he now has also made Swampy a much loved Australian character. He is well supported by Alan Tudyk who plays the pushy American but the scenes here are stolen by Sarah Snook who once again shows why she is an Australian actress on the rise and young Coco Jack Gillies who here shows the world that she is a child actress with a huge future ahead of her. Oddball is a genuine treat. It is a film that has a strong conservational message but doesn’t get bogged down in preaching to its audience. A great script that manages to mix humor and drama together well without becoming to adult for children is a rarity these days, but here it works well and allows it’s talented cast to really show there skills. Different but smart, cute but dramatic Oddball will surprise more than a few people who take the time to watch the film. 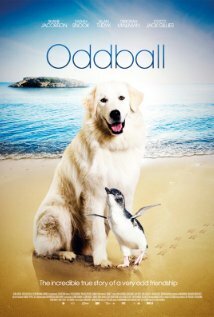 Other Subculture Entertainment Oddball reviews:Oddball with be reviewed in an upcoming episode of The Good The Bad The Ugly Film Show. Summary: Tinker Bell’s (voiced by Mae Whitman) good friend Fawn (Ginnifer Goodwin) creates a stir when she brings a predator into Pixie Hollow to care for. The ‘Eagle incident’ soon sees her cop the wrath of Queen Clarion (Anjelica Huston) and the fairy in charge of security, Nyx (Rosario Dawson) which leaves the young fairy wondering whether or not her kind heart makes her act without using her brain. She soon finds herself torn again however when she stumbles across the mysterious NeverBeast, a creature that she has never seen before. While she decides that she needs to study the creature it soon becomes apparent that the NeverBeast may not be a welcome creature in Pixie Hollow. While animated franchises like Ice Age and Madagascar have dominated the box office over the last decade or so Disney has also had a smaller franchise that has chugged along nicely and never really delivered a bad film. Sure the Tinker Bell franchise doesn’t exactly set box office records nor does it dominate headlines but then this is a series aimed at young girls who are too young to be going out and buying the latest video game or expensive electronics so it has really been a franchise that has been left to its own devices and enjoyed by its fans… and some film critics alike. Sadly despite the fact that the Tinker Bell franchise has never had a weak spot it does look like the latest film, Tinker Bell And The Legend Of The NeverBeast, may be the finale as Disney is yet to commit to a seventh film. If that is the case than it will be a bit of shame seeing that fans of the star herself, Tinker Bell, might be a little miffed at why this Tinker Bell film doesn’t centre around the green fairy but instead centres around her friend, Fawn. Despite that fact however it is hard to fault the film which was written and directed by Steve Loter (who strangely enough also worked on Kevin Smith’s Clerks animated series). Once again the film is entertaining from start to finish and while it doesn’t reach the heights that Tinker Bell And The Secret Of The Wings it still has enough charm to flow along nicely, and yes even contains an ending that may or may not bring a tear to the eyes of both adults and children alike. 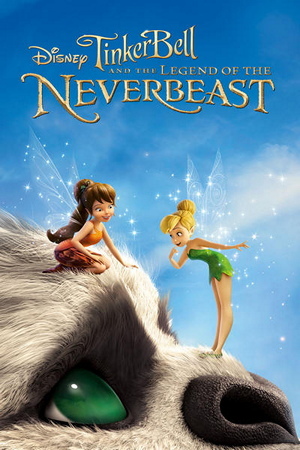 Like the other films in the franchise Tinker Bell And The Legend Of The NeverBeast is not afraid to take the young viewers on a journey that will see some well placed morals drilled into them as well. Topics such a stranger danger are there for all to see, while dig under the surface a little and you will also see the screenplay pushes across valuable lessons in preventing cruelty to animals and also not judging people (or creatures in this case) for looking a little bit different to the way you do as well. Once again this film also manages to again bring a big name voice cast to the table as well. Mae Whitman reprises her role of Tinker Bell and franchise regulars Anjelica Houston, Raven-Simone and Lucy Liu. This time however we also see current ‘it’ girl Rosario Dawson take on the role of the tough Nyx while Once Upon A Time star Ginnifer Goodwin plays the sweet natured Fawn, revealing a natural talent as a voice actress. If the Tinker Bell franchise is to come to a close with Tinker Bell And The Legend Of The Never Beast than it is a bit of a shame. While the film isn’t weak at all, the fact that it doesn’t centre around the main character of Tinker Bell will be a little sad for the fans of this amazing series. With suspense and emotion littered all through out the script this film once again shows one of this is one of the better franchises doing the rounds. Other Subculture Entertainment Run All Night reviews: You can also read our Tinker Bell And The Legend Of The NeverBeast review on The Book The Film The T-Shirt. 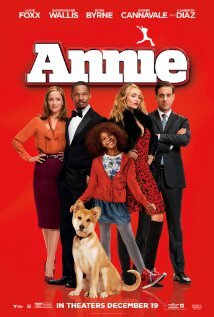 Summary: In the remake of the classic musical Annie (Quvenzhane Wallis) is a young orphan who lives with Hannigan (Cameron Diaz), a washed-up, alcoholic pop star who now lives off the money she earns for looking after a number of foster children… none of which she particularly likes. Annie spends most of her time trying to keep out of Hannigan’s way and trying to piece together what happened to her parents who abandoned her at a restaurant years earlier. Things change for her however when a chance encounter occurs between her and wannabe-Mayor, mobile phone tycoon Will Stacks (Jamie Foxx), his assistant Grace (Rose Byrne) and campaign manager Guy (Bobby Cannavale). The critics seemed to by baying for blood for Annie before the film had even been released. Many were tipping that it was the kind of film that was perfect for a Worst Films Of 2014 list and many even seemed to rejoice in the fact that the cast seemed to be ever revolving door as producer Will Smith tried to put the film together. Then of course there was disaster for the film’s distributors Sony when Annie turned out to be one of the films that the hackers managed to steal from them and release online weeks before it was due to the cinemas. Yes it really did seem like it was going to be a hard-luck life for Annie, but luckily this has turned out to be a film that comes with a few surprises. By the time Annie did reach the cinemas early there should have been more than enough warning signs to indicate that Annie might have a few things in its corner. First of all its director Will Gluck has good pedigree being the man responsible for the fairly well received comedies Easy A and Friends With Benefits. Add that to the fact that the cast contained the likes of Jamie Foxx, Rose Byrne and Cameron Diaz and maybe it was time to start re-evaluating things. Having said all that though Annie is the kind of film though that will divide audiences. Some will instantly dismiss it will others will be able to spot a certain quirkiness that makes Annie it an enjoyable, dumb-but-fun film. Gluck it seems is the perfect man to be at the helm of Annie as he makes sure the film never takes itself too seriously, something that he sets-up from the get-go with an opening shot of a red haired Annie, showing he is only too aware of the original film. He then manages to keep the fun and games going while at the same time pointing out some very relevant facts such as how many black American students slip through the cracks when it comes to things like reading and writing. Gluck makes sure that the film is just the right amount of over-the-top, he allows Cameron Diaz to really go all out and also allows to Jamie Foxx to center himself in the middle ground between comedy and drama. Even the early concerns that this was just going to be a rap/hip-hip version of Annie are put to rest with most of the original songs getting just the right amount of R&B flavour to make them new and interesting but not getting to the point where they are unrecognisable from the original. Bringing on board Sia to oversee a lot of the musical side of things was also a fair touch of genius from the people behind the scenes. The one thing that will hit most people about Annie is how many actors use this film to showcase their many other talents. Rose Byrne has already shown the world she can do more than just drama with her comedic performances in films such as Bridesmaids and Bad Neighbors, here she shows she has another string on her bow by adding singing and dancing to her resume. Likewise Jamie Foxx capitalises on the fact that he already has a successful singing career behind him and manages to make himself a triple threat with music, comedy and drama. Perhaps the biggest acting surprise in Annie though comes from pint-sized Quvenzhane Wallis who has already wowed audiences with her dramatic performances in Beasts Of The Southern Wild (which she scored an Academy Award nomination for) and 12 Years A Slave. Here Wallis also shows she is a worthy little singer and dancer and she quickly wins you over as she plays the sassy and intelligent Annie. Annie isn’t exactly going to be the film that you are going to be raving about for years to come but it is fun enough that you won’t exactly be leaving the cinemas complaining about it either. It’s cute and funny, but never gets annoying, while it’s reworking of the story is just modern enough to make it work and create its own identity. The real plus though are the acting performances. Everyone seems to be having fun and it shows on the screen, especially with Cameron Diaz who seems to love the fact that she is playing a role that completely allows her to lose control. Meanwhile the film even finds time to take a swipe at social issues such as modern politics and how the rich treat the poor making sure the film does have some substance as well. Also watch out for some smart cameos from Michael J. Fox, Sia, Rihanna, Ashton Kutcher and Mila Kunis. Other Subculture Entertainment Annie reviews: For our full Annie review make sure you check out The Good The Bad The Ugly Film Show Ep #110. You can also read our review on The Book The Film The T-Shirt.